Java serialization is a mechanism to persist Java objects in a ordered or sequenced form of bytes, it includes objects?s data and object?s type and type of data that is stored in it as well. Serialization is the mechanism of translating Java object's values and states to bytes to send it over network or to save it on file and disks. On other hand Deserialization is the processs of converting byte code to corresponding java objects. 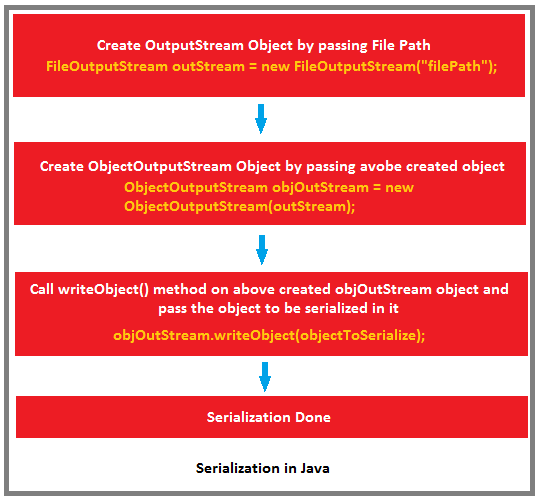 Java serialization API provides mechanism to write an object into streams, disks, db?s or something?. so that the object can be transported over network or can be stored somewhere and can be rebuild again when needed. Getting serialized object again called deserialization. Serialization comes into picture when we need to send an object(not text) over network or store in a file so that the object can be rebuild again when needed. But the network infrastructure and hard disks does not understand java, what they understand are bytes only, and this is what serialization does. It converts java object to bytes and bytes to java object again. All steps are included in the image showing below, lets implement all those steps of serialization one by one to persist a java object to a specified file. A class must implement Serializable interface in order to be serialized, this is a marker interface that does not contain any method in it. Here is code for serialization of java objects, we just need to get an FileOutputStream object from the five we want to persist the object and pass this to ObjectOutputStream's object's constructor. Method writeObject() is used to get bytes from java object and pass them to output stream. 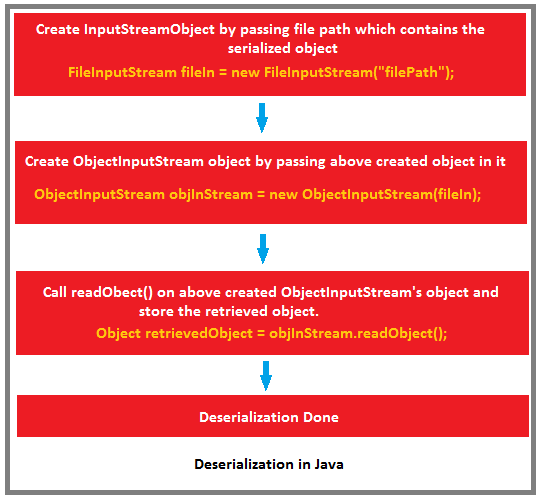 All steps are included in the image showing below, lets implement all those steps of deserialization one by one to get java object back from the file. Here is code for deserialization of java objects, we just need to get an FileInputStream object from the file that contains object's bytes and pass this to ObjectInputStream's object's constructor. Method readObject() returns an object whose bytes are being read from the file. Output: Here is expected output, printing values for deserialized object. Here we are done with Serialization and Deserialization of a simple objcte in java, but in real world applications many other situation may occur. Lets look a little deep in serialization in different scenarios. In case the object we are going to serialize has some reference to other object, then what would happen ?In this case three possible conditions can arise. CASE 1: If the referenced class implements Serializable. In case we have a reference to another object and the referenced class also implements Serializable, that the referenced class will be automatically serialized. In the example below, we have a Employee class that contains EmployeeAddress?s reference in it, in this case the both classes are implementing Serializable interface so both will be serialized. Here is a simple referenced class 'EmployeeAddress ' this class is being referenced by 'Employee' and implements serializable interface. This class w'll be serialized along with Employee. In case the reference class does not implement Serializable it?s variable must be declared transient. CASE 2: If the referenced class does not implements Serializable but its reference variable is transient. In case the referenced class EmployeeAddress does not implement Serializable interface, than there will be runtime error in serializing Employee class. To avoid the error just make EmployeeAddress?s reference variable transient. Transient EmployeeAddress employeeAddress; In this case when we will deserialize Employee class, there will be a null value for EmployeeAddress reference. CASE 3: If the referenced class can not implement Serializable interface and we still want to persist its states. In the above two cases we saw, if a reference variable is there either the referenced class must be serializable or the reference variable must be declared transient. Now the question arises, is it possible to persist states of a referenced class even if the class is not serializable and its reference variable is declared transient. Yes, This is possible ! In that case, Java serialization provides a mechnism such that if you have private methods with particular signature then they will get called during serialization and deserialization so we will override writeObject and readObject method of Employee class and they will be called during serialization and deserialization of Employee object. Here is a simple referenced class 'EmployeeAddress ' this class is being referenced by 'Employee' and does not implements serializable interface. Here we are done with 'Serialization and Deserialization in Java'. In our upcoming blogs we will see more about Java Programming and other opensource technologies.